Fencing has been practised by the military for centuries and has been a form of competitive sport to demonstrate the skills of the swordsman for a very long time. It has also been used for settling disputes and arguments by these very swordsmen by duelling, which often led to serious injury or death. Olympic Fencing has been a regular part of the Olympic games since the 1896 Athens Olympics, which included both individual and team events. Fencing is governed by the Federation Internationale d’Escrime (FIE). A limited number of women’s events were included from 1924 and slowly increased over the years, until in 2008 the number of women’s events were equal to that of the men’s. Events are carried out using a knockout format and the match between 2 opponents takes place on a 14 metre long and 1.5-2 metre wide strip/piste. The goal is to make contact with your opponents target area with the tip/point of the blade or even the blade edge if it is a Sabre event. In the Epee events, both of the fencers can score at the same time, however the Foil and Sabre events have rules of right of way and timing that mean only one fencer can score a hit at a time. The points are scored and triggered electronically, although there is also a referee and a video referee, who monitor rule breaking and a further 2 assistant referees for the final stages. Advance – To step forward. Black card – A card issued by the referee to expel an opponent. Centre line – The line across the pistethat divides it into two equal halves. Compound – A series of attacks or counterattacks. 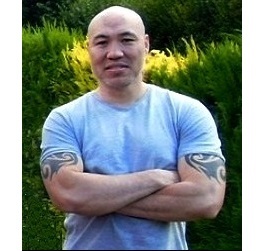 Cupe attack – To lift the opponents blade out the way to effect an attack on the now exposed areas. Disengage – To break contact between the opponents blades. Engage – The contact of both opponents blades. Feint – False attack to get the other opponent to react to it. Fleche – A running attack. Lunge – Lunge with one leg forward and the back leg stretched and the sword thrust forward. One-metre penalty – When a penalty occurs, the action is moved one metre further back on the piste before the restart for the offending competitor. On Guard – Start position. Parry – To block an opponent’s attack. Penalty hit – When a competitor commits an offence after they have received a warning, their opponent gets a hit score awarded to them. Piste – Also called a strip – competitive mat that the challenge takes place. Recover – The return to the on guard position after a lunge. Red card – A card issued by the referee for a violation of the rules. Right of way – designed to stop simultaneous attacks in the foil or sabre events, by allowing the referee to determine who was on the offence and had right of way to score a point. Riposte – To hit back after a parry. 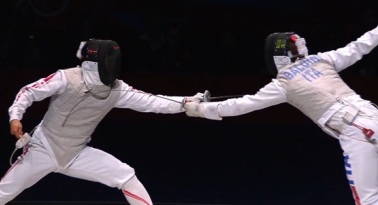 Simultaneous – When opponents in the foil or sabre events hit each other simultaneously, this rule quashes any hits/score made. Thrust – Extending of the weapon to make contact with the opponent. Warning line – Warns the competitor they are 2 metres from the back end of the piste. Yellow card – A card issued by the referee giving a warning for a violation of the rules. There are several events which use different weapons. Epee – this is a thrusting sword similar to those used by duellists of days gone by. Heavier and stiffer than a foil sword. Target areas are the whole body, using only the tip of the blade. Foil – this is a light flexible thrusting sword with a rectangular blade. Target areas are the torso, using only the tip of the blade, although both trusting and using a whip technique are allowed. Sabre – this sword is light and flexible sword. Target areas are anywhere above the waist, using both the tip and the edge (with a slash) of the blade.